A flowering Chilli Mandragora with blossoms native to Phindym. This Chilli Mandragora species was produced by selected breeding. A great deal of expertise and knowledge is required in order to produce the different colours of flowers. 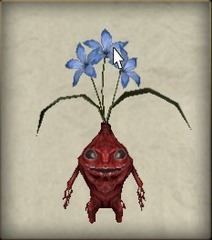 Recently, this was used as a qualification test for Mandragora breeders.